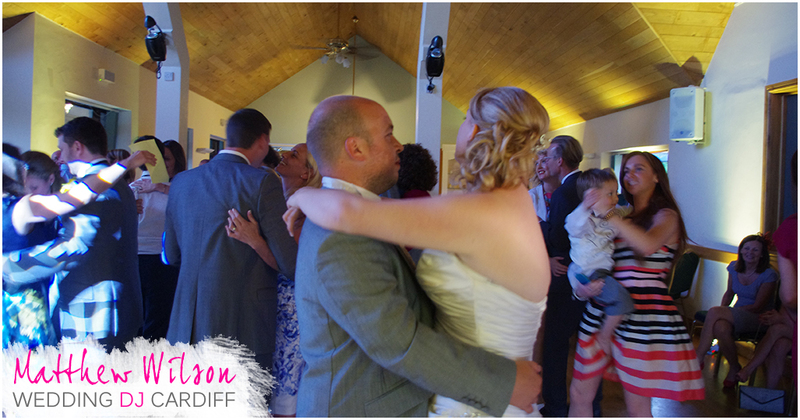 On 9th August 2013, Adam and Rebecca got married and celebrated at the Canada Lodge, Creigiau, Cardiff. They booked me as their wedding DJ to provide a full evening of entertainment at the lovely lakeside retreat. While the guests were downstairs eating from the authentic BBQ menu, I was upstairs setting up the entertainment. This consisted of uplighting hire, moving head lighting and my twinkling starlit DJ booth. 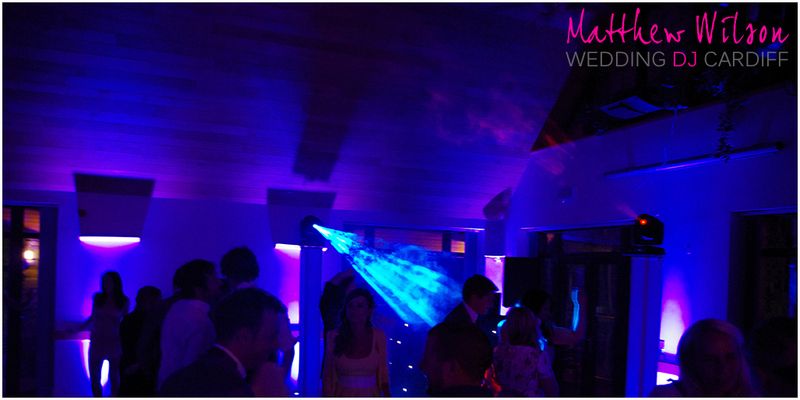 The uplighting was positioned right around the room to create a lovely glow of colour which really brings any venue to life. The first dance song was Marcia Griffiths – The first time ever I saw your face. The uplighting was set to yellow for this to match the theme of the wedding. Straight after the first dance I started the dynamic uplighting system which linked the disco lighting with the uplighting to create a stunning effect. The buffet followed the first dance and guests helped themselves to a choice of cheeses from the cheese board. The guests had many requests played throughout the evening and the night drew to a close at midnight. I had a great time as Adam and Rebecca’s wedding DJ and it was an honour to work for such a lovely couple. I would like to thank Adam and Rebecca for booking me all those many months ago. Your guests were great and really knew how to party!